Conquer Club • View topic - [Abandoned] - Lifeguard Wars! All territories are neutral except for the starting lifeguards. 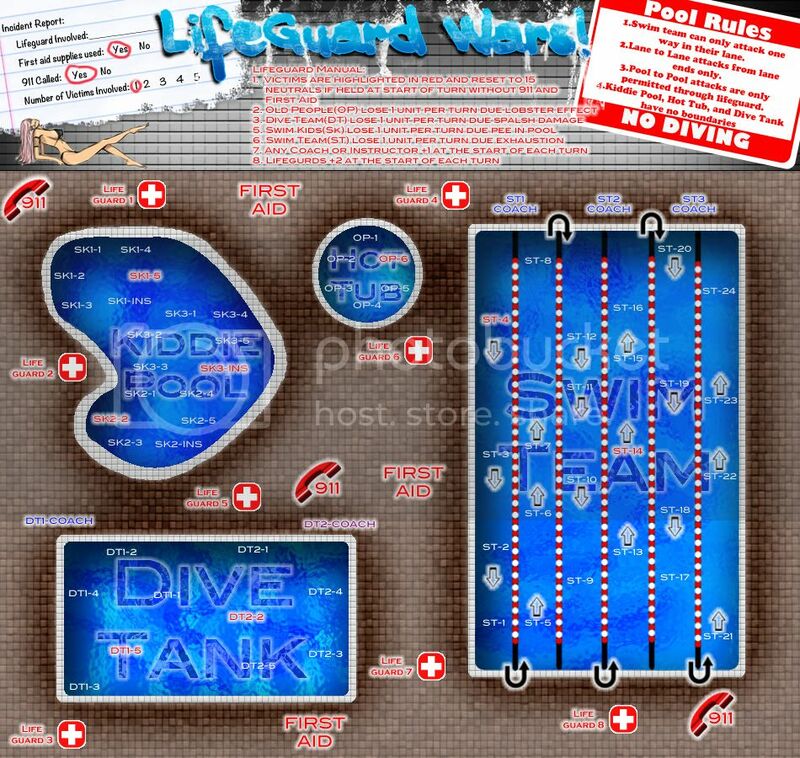 Kiddie pool, Hot tub, and Dive tank are free attack anywhere in the pool, main pool is structured one way. To attack from pool to pool you need to attack from the lifeguards. Last edited by s3xt0y on Sat Nov 12, 2011 5:09 pm, edited 12 times in total. I have rethought this map a bit. I think I am going to make it an objective map where you start as the lifeguard and have to rescue all the victims in the pool and call 911 and get the first aid kit. The other bonus's would still be in play. Everything but the lifeguards would be neutral. Any thoughts? I will be adding the territ's in over the next couple days and working on the map graphics. Now that I have the general idea down! For the large pool - how about only Adjacent lanes can attack each other and having a smaller bonus for the 2 outside lanes. If you are going to do objective, I would suggest making the First Aid kits large neutrals. TheMissionary wrote: If you are going to do objective, I would suggest making the First Aid kits large neutrals. Please put the last update date in the title of the thread in this format [23 Oct 2011], brackets included. This will help the CA's and FA's know when you have posted a new update. Thank you. isaiah40 wrote: Please put the last update date in the title of the thread in this format [23 Oct 2011], brackets included. This will help the CA's and FA's know when you have posted a new update. Thank you. Graphics look good for a first draft. I'd think about limiting the amount of 911's or First Aid Kits there are, maybe down to just one each. Otherwise the objective might be a little easy to acquire and maybe make it a killer neutral as well as large, maybe both of them. I'm also having a little trouble identifying who the victims are. Overall, I like the idea and think its sort of similar to the baseball map. Hope my thoughts helped. nolefan5311 wrote: Graphics look good for a first draft. Victims aren't in there yet. The coaches aren't either. And I agree on that I think I'll put them in the middle and they will be attacked by all of them. when sitting on any lifegaurd one can actak any swimmingpool and the ohter way around ? I am also new at the foundry and one thing I've learned now is to have patience, the foundry consists of volunteers and we are many who would like to have pushed our things through, you have a nice map with good gameplay, I'm sure that there will be looked carefully at your map, which is I believe already have a solid theme context. I think it's a brilliant idea! Soldier on!! I'm checking this one out for the second or so time and initially it didn't really excite me all that much... so in my opinion, what could be done to improve it. To add what IH mentioned, you could have some chairs around the pools and have them as a sunburn decay! Industrial Helix wrote: I'm checking this one out for the second or so time and initially it didn't really excite me all that much... so in my opinion, what could be done to improve it. Your application has been noted, when you get your next draft posted, I will then go over it and we'll go from there! I have a question, can I code that if a player holds the chemical room for a specific pool that all the units in the pool with decay each turn?